Cynthia was born and raised in Connecticut and moved a few times to eventually settle here in Virginia Beach. She lived in New York City for several years while obtaining a graduate degree and teaching high school. During that time, she witnessed the early feminist consciousness which was reemerging in social awareness in New York and in other parts of the Country. She taught English as a Second Language in Paris for a year, and, after a few years in DC, Cynthia moved to the Virginia Eastern Shore. There, she operated a craft shop featuring work by women, was employed as a social worker, welcomed an 18 month old daughter from El Salvador into her household, and began study for a Master’s Degree in Social Work. After moving to Virginia Beach, Cynthia was a Social Worker in public agencies before starting an ongoing 25 year career as an Outpatient Mental Health Therapist. 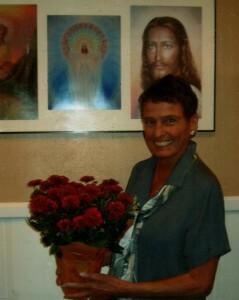 Cynthia has attended the Fellowship of the Inner Light for 30 years. She was Ordained as a Pastor in 2005. Her theology is best informed by Rudolph Steiner and Paul Solomon. She believes our purpose on the Earth Plane is to learn to live into our own divinity and our Oneness with God and ALL THAT IS.